It would have been useful if the ticket reminded us to take swim wear and towels, as a beach visit was included. Very safe. Top of Mountain View’s. It was AWESOME! One of the best zip lines ever. All the employees were fantastic and everything was clean and great! Tree Limin&apos; was fantastic and I think it offered the highest and most beautiful views of the whole entire island. Everyone was incredibly kind and laid back!! I would do it again a million times over! Just what you&apos;d expect when ziplining. Just what you&apos;d expect when ziplining. Great crew, beautiful views and safe equipment. All in all a great experience. Canopy Zipline Adventure to Tortola & Island Drive - HORRIBLE! We decided to try Zip lining; we did a Carnival excursion called Tree Limin extreme. Incredibly safe and well run zipline adventure. Incredibly safe and well run zipline adventure. You go on 6 different ziplines. All a lot of fun with unbelievable views of Megan&apos;s Bay and the island. 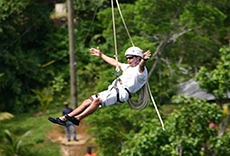 went ziplining with Tree Limin Ziplining. Beautiful views, great service and guide staff who took extreme safety care. We booked this ziplining through the cruise ship to make sure we would be back in time. Awesome views. Great staff. The last line was different. Never seen one like it before. Not going to spoil it for people who want to go. A must for the adventurous. A must for the adventurous. Very safe and organized. Best excursion of the two weeks. Beautiful views and very funny guides. Fun time, pretty well organized. Fun time, pretty well organized. They want to make sure you have fun, which once you get over the fear factor (for us older adults) it&apos;s a good time. Fantastic experience! Well organized and safely conducted. Great job by Sean and teh whole team at the Tree Limin&apos; excursion. Great job by Sean and teh whole team at the Tree Limin&apos; excursion. Take a hat or a bandanna to make the helmets more comfortable.